What do Valentines want? Cookie Cakes of course! 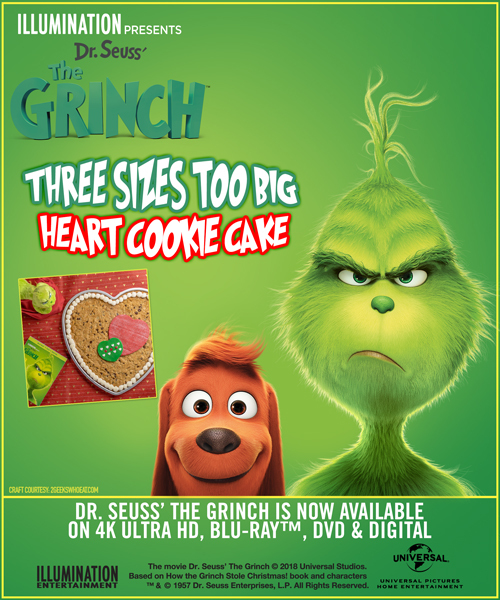 Win over even the grinchiest of hearts with this yummy Heart Cookie Cake from Dr. Seuss’ The Grinch! If you don’t have a Valentine, you’ll need the sweets! Download the instructions here. The Grinch is available now on 4K Ultra HD, Blu-ray, DVD & Digital! My Earliest GRINCH Memories – The cast and filmmakers of Dr. Seuss’s The Grinchreveal their earliest memories of the grumpy green character and the enduring appeal of this Christmas curmudgeon’s journey to redemption.